Running nine miles from north to south and never more than five miles wide, the Malvern Hills are the perfect attraction for energetic walkers looking for a quick outdoor fix. Hiking trails weave like silly-string around the peaks, rising abruptly (and stunningly) from the flatlands of the Severn valley. The best of the lot is the clamber up to North Hill, the tallest peak (1370ft), with exquisite panoramic views and a handy stop off point at St Ann’s Well Café. Here you can replenish your water bottle with the fresh spring water that bubbles from the hard granite beneath. The enriching H2O is actually a bounty that gave the place its Victorian fame and bolstered the village of Great Malvern into a thriving spa town. Today, the attractive settlement is more of a scenic spot to grab your hiking guide and trail pamphlets before heading off on the hoof. For those who stay on the lower levels, it is a pleasant two-mile walk from the village to the Blackmore Camping and Caravanning Club Site. In fact, with 200 pitches and a number of static caravans, the site is almost another village in it’s own right – complete with playground and small, essential-selling shop. But for all its vastness Blackmore still has a thoroughly welcoming feel. Staff are friendly and personable, facilities are excellent and a grassy tent-only field gives traditional-minded folk their own secluded countryside space. One of the real attractions here are the newly erected safari tents, ensconced in their own quiet corner of the site and kitted out with a fistful of furnishings that mean you can turn up with nothing but the bed-sheets. Sofas, dining furniture, double beds and a well-equipped kitchen make camping a seriously comfortable affair; an agreeable base for those travelling light. In the immediate vicinity it’s the hills that dominate. The band of protected hummocks dip and climb, punctuated by over 20 peaks, most of which are around 1000ft. They have long been a source for artistic inspiration from the likes or composer Edward Elgar, to the fabled mountain landscapes of J.R.R Tolkein’s the Lord of the Rings. The various local villages, though, are also a delight (and some of the most prosperous in the West Midlands). Try starting off at the local priory church in Great Malvern – a leading example of Perpendicular Gothic architecture, encrusted with late medieval stained glass windows – before moving on to the famous cathedrals in Hereford and Worcester. The two historic county towns are less than half an hours drive away, making this campsite a hotspot for culture vultures as well as those peering out their tent-flaps to the hills and another day's walking conquest. 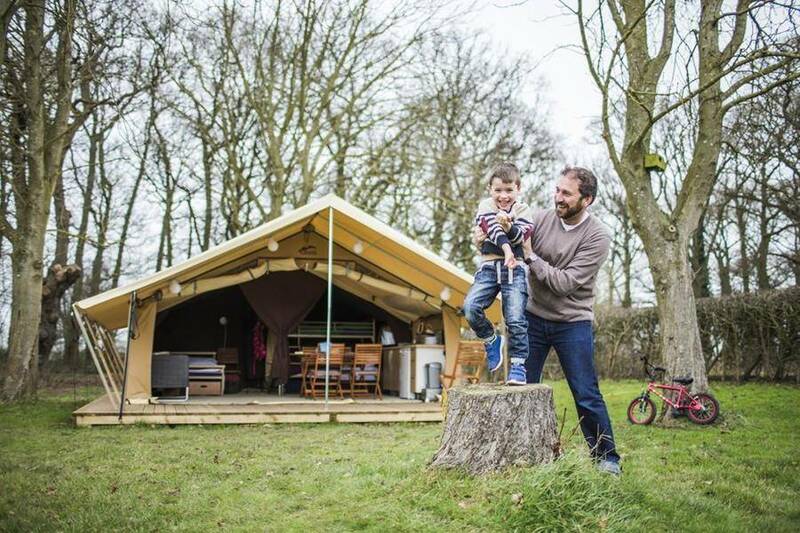 Nestled deep in the Worcestershire countryside, our glamping holidays in Blackmore serve up all the fun and freedom of camping with a dash of hotel-style comfort. Yet, you won't find stuffy rooms or temperamental key-cards here. Get closer to nature with stunning views of the Malvern Hills, straight from the comfort of your own private shelter. Glamping in Blackmore brings you all the earthy pleasures of camping within a well-equipped site, complete with toilets and washing areas, dishwashing and laundry facilities and even Wi-Fi. Easily the best part of our award-winning Blackmore glamping site is its proximity to the glorious Malvern Hills. Your retreat offers a canvas-wrapped 2-bedroom haven, complete with full beds, sofa and dining area. The home is perfect for family and friends alike, sleeping up to 6 people comfortably (4 adults max). Storage space is provided, and the kitchen and dining areas give you plenty of options for feasting inside or out. The tent is furnished with contemporary fittings. Under foot is sturdy wooden decking extending to the shaded veranda, where you can switch on the lights and enjoy watching nature unfold. Kick back and relax by making the most of indoor/outdoor living. Your veranda gives you the perfect viewpoint to see a variety of nature of your doorstep or to enjoy making memories playing games, making lunch together or watching the world go by. Your living area gives you plenty of space for quality time together and is made for enjoying laughter, drinks and meals together. 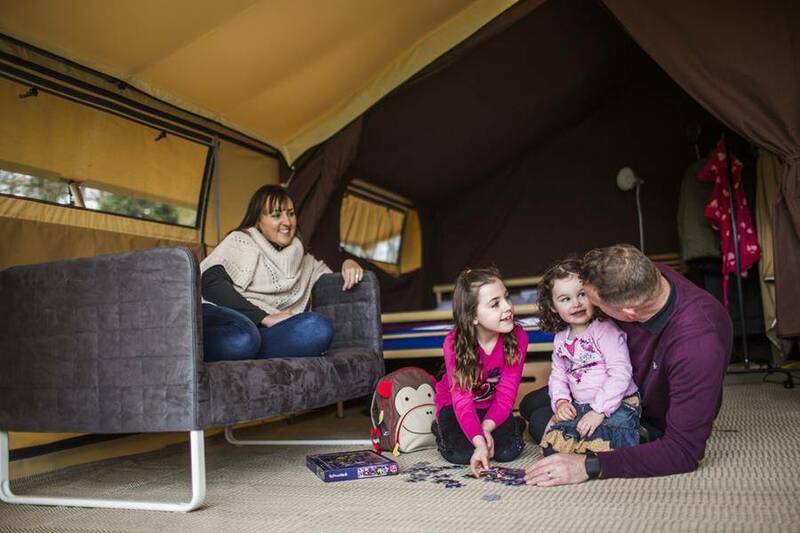 Why not revive tradition and bring along some board games or cards to enjoy in the evenings, where you can cocoon yourselves in your warm Ready Camp tent? It’s nice to spend time together, but sometimes it’s nice to have privacy too! With this in mind, each of our Ready Camp bedrooms has been screened off, meaning total privacy at your fingertips. With comfortable, full-size beds you’ll enjoy a great sleep too, just bring your bedding to snuggle into! Up to 6 people (4 adults max) will be well catered for in two double rooms – where you can shut yourself away for some well-earned me time. Kids are well catered for, with bunk beds and pull-outs meaning they can share their adventures together – what could be better?